Name of a teachers' convention which was held in Babylonian academies, after the beginning of the amoraic period, in the two months Adar and Elul. The original meaning of the word is not known. It is always written with ה ( ), as the Hebrew word for "bride"; but the manner in which this meaning has been connected with a convention of teachers (Levy, "Neuhebr. Wörterbuch," ii. 321) has not been satisfactorily explained. Perhaps the word is merely another form of the Aramaic = "totality," although this word never occurs in traditionary literature as a designation for a collection or assembly of people. It may be connected also with the Aramaic = "garland," the assembly of teachers being thought of as a garland adorning the academy (comp. "Ḥazi ha-Goren" and "Kerem" as designations of the circle which the Sanhedrin formed). In Latin, also, "corona" means "circle," "assembly." Kohut ("Aruch Completum," iv. 428a) has a similar explanation, although he adds an incorrect comparison with a Persian word. The importance of the Kallah (referred to under another name) is extolled in the Midrash Tanḥuma (Noaḥ, § 3): "God has appointed the two academies ["yeshibot"] for the good of Israel. In them day and night are devoted to the study of the Torah; and thither come the scholars from all places twice a year, in Adar and Elul, and associate with one another in discussions on the Torah." The greater the attendance at the convention, the greater was the renown of the academy. Hence Abaye says (Ber. 6b): "The most important part of the Kallah is a crowd." The unpleasant side of this crowd is characterized by Abaye's colleague Raba as follows (ib. 6a): "The crowd at the Kallah is caused by the mazziḳim" (the unseen tormenting spirits which hover around people). There was a saying in Babylonia that whoever dreamed of going into a forest would become president of the Kallah (the Kallah being likened to a forest). 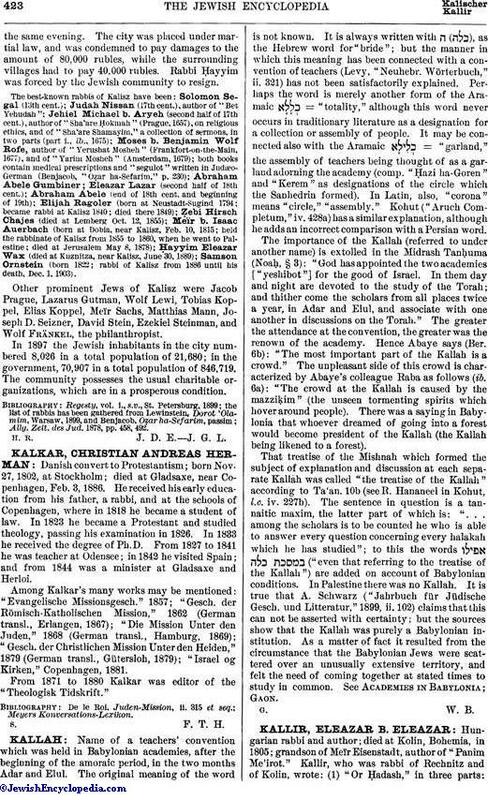 That treatise of the Mishnah which formed the subject of explanation and discussion at each separate Kallah was called "the treatise of the Kallah" according to Ta'an. 10b (see R. Hananeel in Kohut, l.c. iv. 227b). The sentence in question is a tannaitic maxim, the latter part of which is: ". . . among the scholars is to be counted he who is able to answer every question concerning every halakah which he has studied"; to this the words ("even that referring to the treatise of the Kallah") are added on account of Babylonian conditions. In Palestine there was no Kallah. It is true that A. Schwarz ("Jahrbuch für Jüdische Gesch. und Litteratur," 1899, ii. 102) claims that this can not be asserted with certainty, but the sources show that the Kallah was purely a Babylonian institution. As a matter of fact it resulted from the circumstance that the Babylonian Jews were scattered over an unusually extensive territory, and felt the need of coming together at stated times to study in common. See Academies in Babylonia; Gaon.